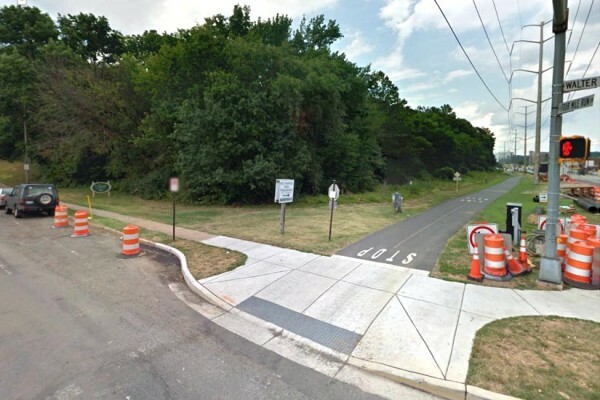 A dedicated team of neighbors who live near the Dora Kelley Nature Park in Alexandria withstood the erratic weather for more than three weeks, from February 27 to March 23, to track the movement of frogs to the park’s marsh area where they breed in the late winter. 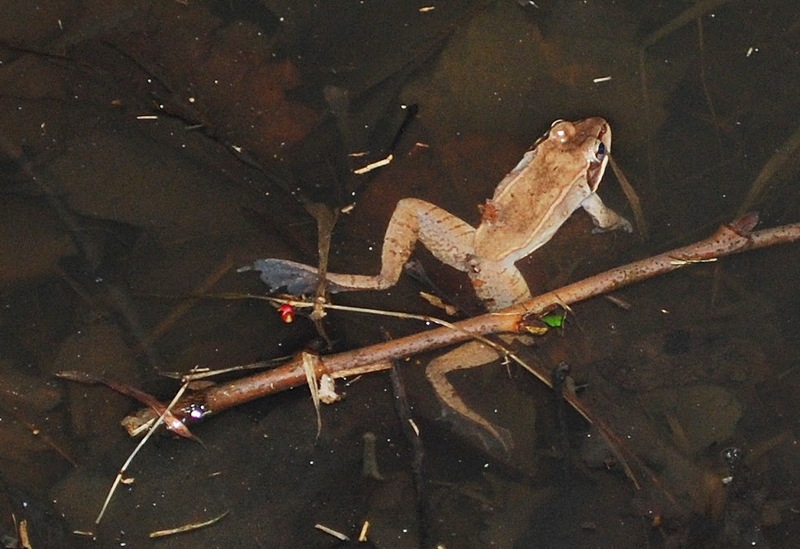 This was the second year for the patrol in which individuals note the movements of frogs (primarily Northern Spring Peepers (Pseudacris crucifer) and Wood Frogs (Lithobates sylvaticus). These frogs winter in the adjacent woods and make the annual trek to the marsh where they likely were born. We then share the information with Mark Kelly and Jane Yeingst at Buddie Ford Nature Center for their frog database. The neighbors partnered every other evening on an average for about an hour to count the frogs that crossed a path to and from the marsh and note the conditions –– temperature, wind, noise level, and other area observations. 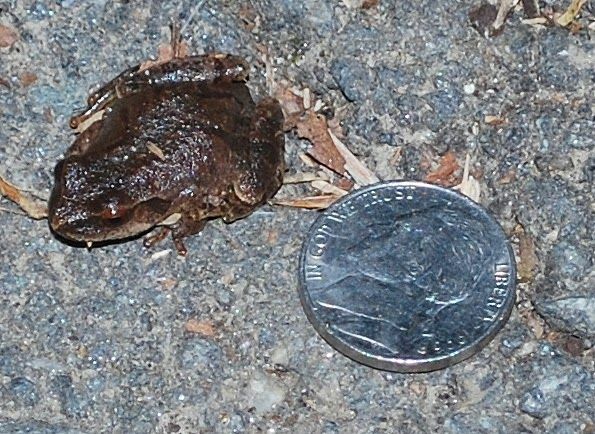 Northern Spring Peeper on path photographed 3-24-14. Wood Frog in marsh photographed 3-19-14. Irruptive movements may be driven by weather, breeding success, or prey scarcity up North. Snowies have been seen recently at Dulles, Manassas, and Reagan National Airports, some of the Atlantic beaches, and even in downtown DC. The owls may be attracted to airports and beaches because such places remind them of their native tundra. Two Snowies have been spotted at Reagan National for several weeks. On January 27, 2014, David Farner organized an informal late-afternoon gathering of ARMN volunteers at Gravelly Point to look for the owls. Both were seen. I arrived at about 5:15 pm and got good looks at one of the owls. A snowy owl at Gravelly Point. Photo by S. Young. The photo is a “digiscope,” made when I held my smart phone camera lens to the eyepiece of my spotting scope. 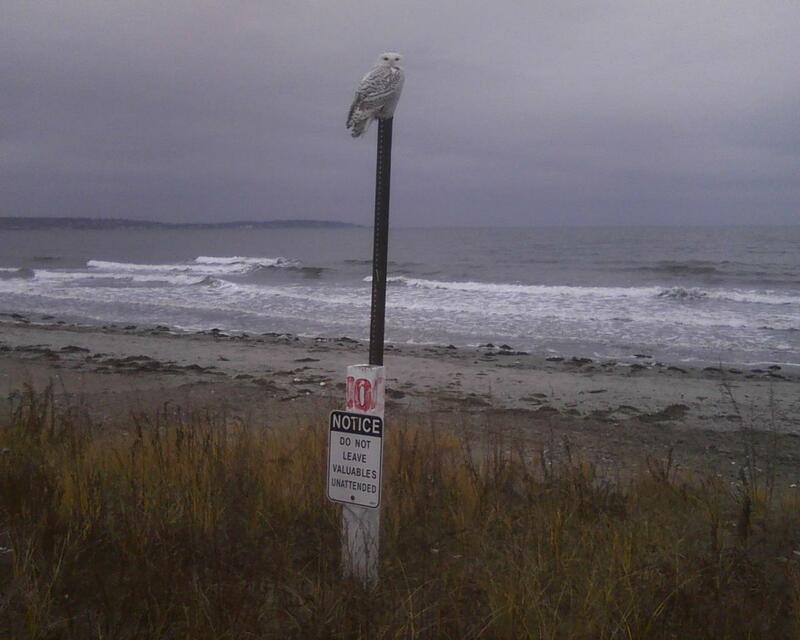 This owl appears to be a scofflaw, as it is brazenly ignoring the threatening language on its sign perch. It made an interesting bobbing motion with its head a few times. I thought this might be a territorial display, but it seems it may be a motion made to help the owl discern prey movements. Snowy owls are special birds, not often seen here, so catch the show if you can! The Christmas Bird Count season is here once again. There will be opportunities for ARMN members to participate in this great citizen science effort with a 114-year history this season. The first counts begin this Saturday, 14 December 2013 and the last counts take place Sunday, 5 January 2014. Popular for ARMN volunteers are the DC Count on 12/14/13 and the Fort Belvoir count on 1/5/14. Jim Olivetti, a graduate of the first ARMN training class in the fall of 2008, sent this photo of a snowy owl taken near his home in Massachusetts. Snowy owl seen on 8 December 2013 on the Massachusetts Bay beach causeway leading to the town of Nahant, 12 miles north of Boston. A friend of Jim’s took this photo on December 8 on the Massachusetts Bay beach causeway leading to the town of Nahant, 12 miles north of Boston. Jim follows ARMN activities from afar and sends this photo with holiday greetings to all. 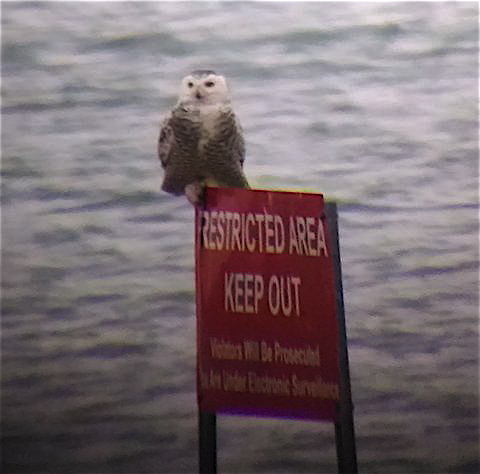 There are also reported sightings of Snowy Owls at Manassas Battlefield and at Dulles Airport. Volunteers participating in this weekend’s Christmas Bird Count may be in for a treat! There is still time to sign up for the 114th annual Christmas Bird Count: http://birds.audubon.org/get-involved-christmas-bird-count-find-count-near-you. Participation counts for volunteer hours and may count for advanced training. 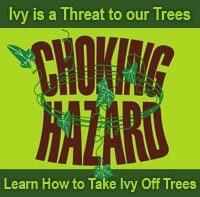 Steve Young and Jim Olivetti contributed to this post. When purchasing fresh, organic and locally grown fruits, vegetables, meats, honey and bread at the Saturday City of Falls Church Farmers Market, be sure to stop by the Falls Church Environment (FCE) booth. 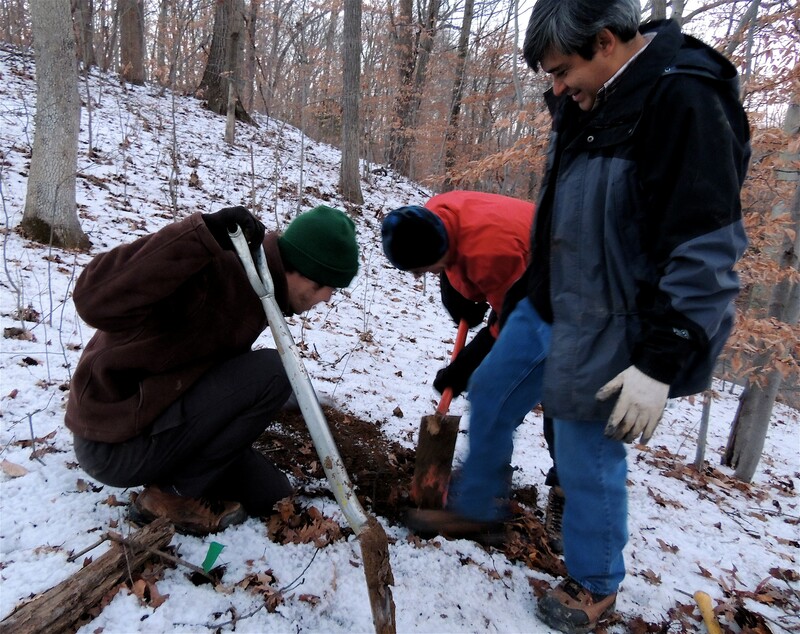 The FCE was formed to provide environmental outreach and education, filling a void created when the City of Falls Church defunded its environmental outreach program. The goal of FCE is to instill a sense of community ergo a level of ownership by promoting local initiatives. The FCE is a collaboration between members of the Arlington Regional Master Naturalists and other local environmental organizations, such as the City of Falls Church Habitat Restoration Team, Fairfax Master Naturalists, Fairfax Master Gardeners, Green Springs Master Gardeners and Fairfax County Tree Stewards. The FCE booth is currently operated on Saturdays from 8 AM to Noon, October through November. At the booth, educational materials are provided to assist residents in recognizing the impact that their life styles have on the environment, and what they can do to mitigate the impact. 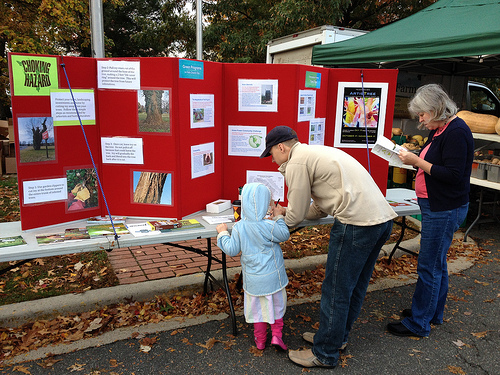 Along with the FCE booth at the City of Falls Church Farmers Market, the Falls Church City Environment Web provides information online to facilitate environmental outreach. ARMN President Caroline Haynes: Many thanks to ARMN member Kent Taylor, who has taken a leading role in coordinating these efforts! 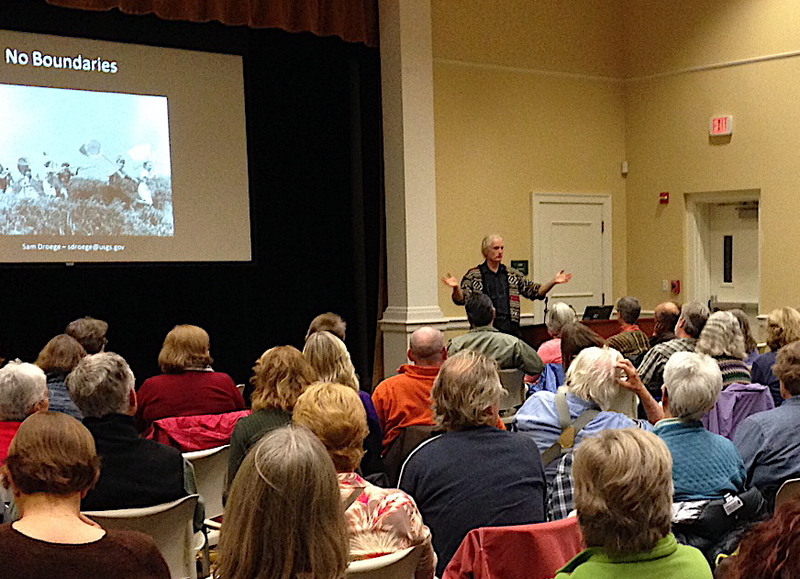 ARMN members, Master Gardeners, and others who had the good judgment to attend an information session at Fairlington Community Center on October 10 were rewarded with two hours of advanced training––and a lot of bee-themed standup, courtesy of Sam Droege. Droege, a wildlife management expert with the USGS Bee Inventory and Monitoring Lab, shared his vast wisdom about North American bees, their habits, and their undisputed value as pollinators, while busting some of the myths surrounding the often-misunderstood insects. The USDA and US National Park Service (NPS) – George Washington Memorial Parkway (GWMP) recently published an article in Banisteria, Number 41, 2013, a journal devoted to the natural history of Virginia. 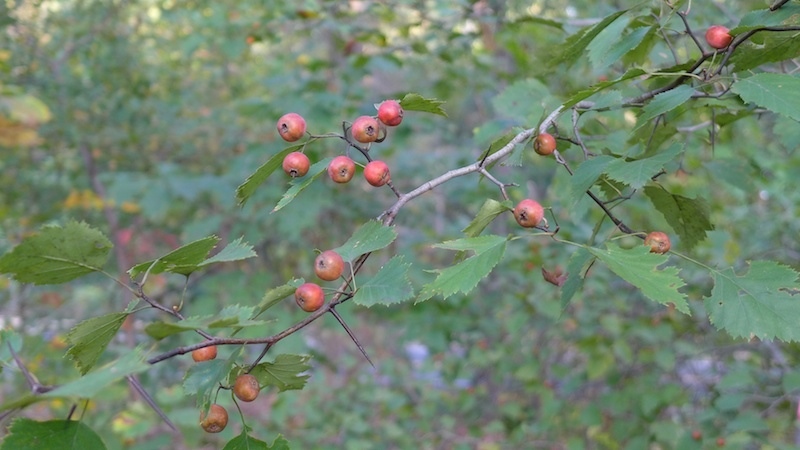 The article documents the results of a study of leaf beetles found in Great Falls Park, Turkey Run Park, Dyke Marsh Wildlife Refuge, and Little Hunting Creek. 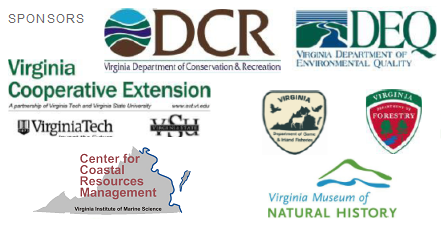 107 species were found, of which 3 were documented for the first time in Virginia. This study increases the number of known Chrysomelidae leaf beetles in the Potomac River Gorge to 187 species. 7 ARMN members were acknowledged for their contributions to the study. Under the guidance of Erik Oberg, NPS Biologist and ARMN Instructor, they “diligently” sorted specimens from malaise trap samples. ARMN members continue to support this service project, collecting, sorting, and mounting insects. The current focus is on microwasps. Volunteers were previously recognized for their contributions in another paper (Banisteria, Number 39, 2012) and were awarded in October 2012 the George and Helen Hartzog Award for an Outstanding Volunteer Group by the Eastern Capital Region of the National Park Service. The volunteers’ meticulous work, totaling over 1100 hours in the last two and a half years, enables scientists to focus their time and knowledge on difficult and highly specialized species identification. This on-going service is a fine example of the value of Citizen Science and the positive impact volunteers can have in furthering science. Congrats to all the ARMN members who support this meaningful service project!